Question: What does Hamburger America, NYC Food guy, A Hamburger Today, Burger Club New York, BurgerClub.org, New York City Search, Gridskipper, Urban Spoon, NYMag.com, The New York Daily News, Manhattan.About.Com and Zagat all have in common? 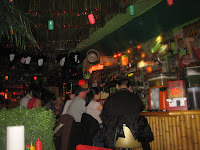 They have all some how forsaken one of the best burgers in New York…The Trailer Park Lounge. 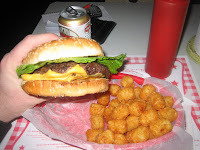 I eat a lot of burgers, I read a lot of lists about burgers, I RSS a lot of burger blogs and news feeds. You can pretty much say that I am a hamburger obsessed, crazed, junkie, fanatical, fiendish, captivated, fixated, possessed and so on and so on. I devote a lot of my time and my money to one of America’s greatest hot sandwiches. I take the hamburger very seriously. So I am absolutely befuddled that my brothers and sisters of the burger have some how forsaken one of the greats. But that is why I am here right? 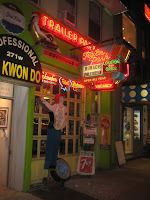 Dressed up to look like the front lawn of a real trailer, the Trailer Park Lounge in Manhattan’s Chelsea neighborhood was voted one of the top 5 “kitschiest restaurants in America” by the Food Network. 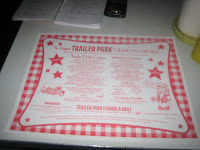 Complete with a Tiki Bar, lawn flamingos, velvet Elvis’, bowling decor and the actual side of a real trailer, you won’t find a more fun and wacky place to have a burger in the 4 corners of the globe. Be sure to head over on Monday’s and Tuesday’s for the “Burger and beer” special for only $7.49. If you time it right, you can get $3 cans or drafts and $5 margaritas during “Happy Silly Giddy” hour from 4-7 pm. All burgers come with sweet potato fries or tater tots and you may as well pretend the first option doesn’t exist. 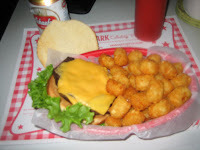 Any burger fan worth their weight in ground chuck knows, it’s all about the tot baby!! They are the carbohydrate version of heroine and no one does them better than the Lounge. If you have the stomach or have others you can share with, get the mac and cheese. It’s just about the best damn M&C; since your mother’s kitchen. 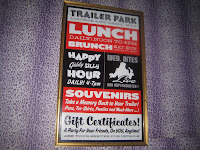 If Elvis is still alive, you’ll find him at the Trailer Park Lounge wolfing down a “double-wide” with cheese and chili mac. So to my burger eating friends mentioned above, say when and I’m there. This entry was posted in Bar, Beer, Best Burger in New York, Best Of, Hamburgers, New York and tagged a hamburger today, about.com, best burger, burger conquest, cheese, chelsea, ciancio, city search, french fries, hamburger, hamburger america, kitschiest restaurants in America, new york, new york daily news, nyc, rev, review, tater tots, the rev meter for social community, trailer park lounge, zagat. Bookmark the permalink. how’s the bun? standard white? nice char on the outside of the burger? you still havent had the bk diner burger have you? @ NYC Food Guy – standard white bun but with sesame and toasted. it works. i went american but there are other choices. in a place like this, you gotta go american. BK Diner burger is good times, count me IN !! I want to eat one of those burgers, now. 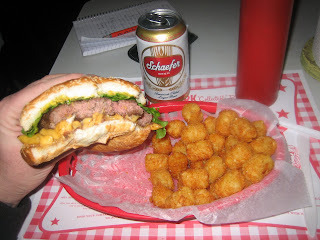 trailer park lounge burger was worth the trip downtown. after having their “double wide” burger i won’t eat for 2 days, that thing is humongous. great margaritas too. I had a cheese burger with american cheese and was disappointed… I had to put ketchup and mustard so it would have some sort of flavor. tots are the weakest of all fried potato products.